Professor Steven Gabriel (ME) was an invited speaker at three European energy-related workshops in September and October this year. 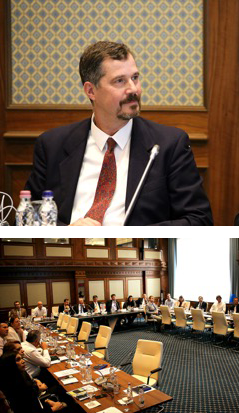 On Sept. 19, Gabriel was a panelist and gave an invited talk on “Strategic Modeling of the European Gas Markets and Gas Supply” at the Applied Mathematics in Energy Regulation Workshop held in Budapest, Hungary. It was sponsored by the Hungarian Energy and Public Utility Regulatory Authority. Gabriel was one of a few invited speakers to provide modeling and policy guidance on the European energy landscape. At the Energy Transitions 2016 Workshop held in Trondheim, Norway, Oct. 20-21, Gabriel gave an invited talk on “Demand Response in Power Markets: Application to the ERCOT (Texas) Market.” This event was co-sponsored by the Norwegian University of Science and Technology and Statoil, the Norwegian National Energy Company. Gabriel also served as a panelist at the workshop. Gabriel gave an invited plenary talk on Oct. 27 at the workshop on Optimization Challenges in the Evolution of Energy Networks to Smart Grids at the University of Coimbra, Portugal. He spoke on “A Simulation Model for Determining Optimal Demand Response Actions: Application to the ERCOT (Texas) Power Market." Dr. Gabriel is an affiliate faculty member of the Institute for Systems Research.